Furniture that tells a story. 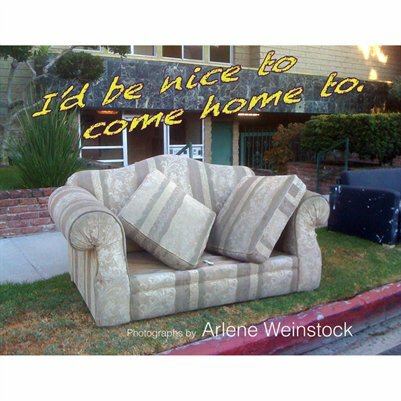 People leave furniture on the street in hopes it will be picked up. It is hard to give or throw away things that have been a useful part of life. Each person who looks at this book has a favorite picture. What's yours? Arlene Weinstock is an artist and teacher who is known nationally for her work in mixed media with colored pencil, and photography, She is a leading proponent of the loose colored pencil style. Arlene teaches art and creativity to adults at colleges, art centers and businesses in the Los Angeles area. She was awarded Signature (CPSA), Experimental Signature (CPX), and Five Year Merit recognition from the Colored Pencil Society of America (CPSA). Her work has won awards in local and national juried art shows and it has been published. Arlene currently teaches for Santa Monica College Continuing Education, and the Palos Verdes Art Center. She is an Instructor and demonstrator for Lyra a division of the Dixon Ticonderoga Company of Lake Mary, FL. She teaches workshops in Advanced Colored Pencil Techniques and Creativity locally and nationally. Joan Porte, Astrologer, interviews Arlene about Creativity.